I caught these two at the tail end of the massive Climate Conference demonstration today. The press here are reporting that 100,000 took to the streets in one of the highlights of the conference. That puts these two in the 99,000's. In Copenhagen there are always bike shops close by. In a 1 km radius around my flat I've counted 22 bike shops. This is where you get your flat tyres fixed and where you get air. No self-respecting bike shop doesn't have an air hose running through the wall to the street. 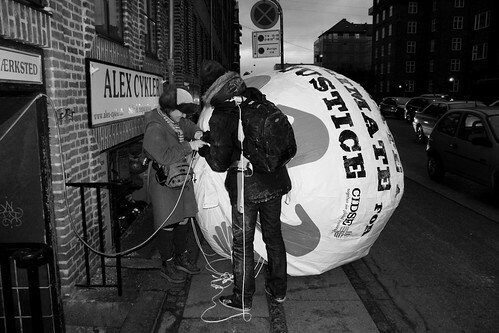 These two demonstrators had protest balloon issues and were laughing as they experimented with filling the balloon with air from a bike shop pump.